Halloween scary? It’s nothing compared to the 5 bridges of the Head of the Charles Regatta (not to mention hundreds of thousands of spectators watching or the logistics of an international competition). 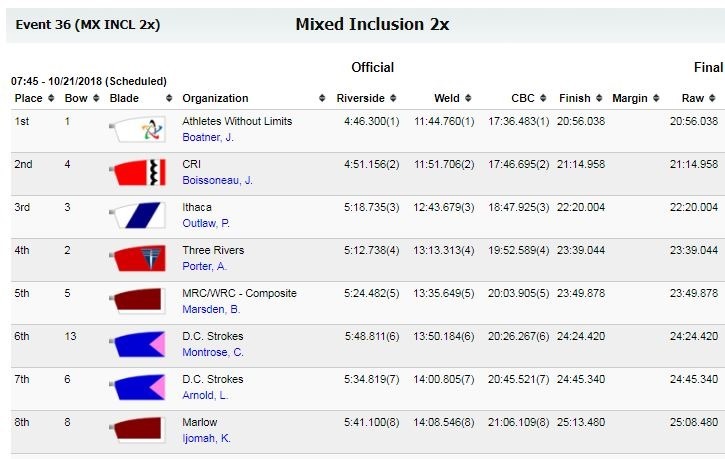 The HOCR is not just biggest 2 day rowing event in the world, but it is the most prestigious, exhilarating and professional event a club adaptive rower will ever compete in. The support infrastructure in the whole affair is astonishing with both generous funding as well as 1,800 volunteers marshalled to support 11,000 competitors rowing in over 1,900 boats in 61 events. 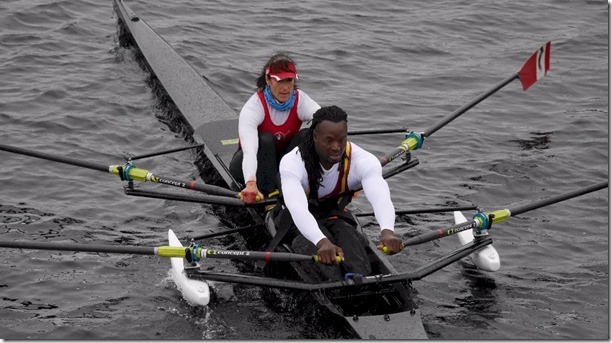 Boating – The Adaptives boat at the BU Boathouse which is also the race start line. So the adaptive rowers don’t need to endure the 3 mile slog from the main boating area to the start line. 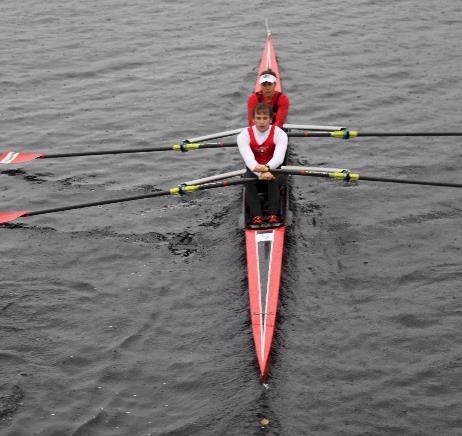 Transfer – Since most of the boats are staged at the main regatta area by the finish, HOCR organises a trailer to take the adaptive boats to the BU boathouse for them. They also provide a shuttle the morning of the race so that competitors can park easily at the CRI boathouse and be dropped off right next to the boating area (parking in that part of town is impossible). Volunteer Support – An army of volunteers are available at the start who do everything possible to help the competitors (mind you this is not just an adaptive thing, but pervasive across the whole event). Volunteers carry your boat to the water for you. They also gather up your possessions and put them in marked tubs and take them to the finish line for you so they are waiting there when you are done (and different crews land in different areas). And when you arrive at the finish line landing stage, they take the boat out of the water for you and take it wherever you need it to go (usually to the boat supplier you have rented it from). The UK was the leading overseas country participating with 42 other clubs coming over (Germany had the next most with 20 entries). 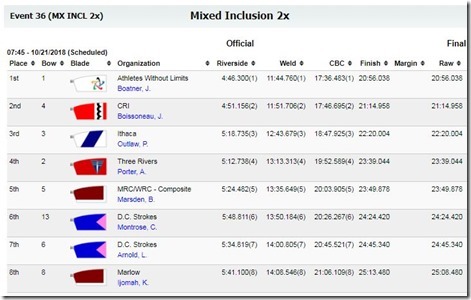 That means that if you are thinking of taking on the HOCR and your club is not participating, you might be able to find a nearby club that you could nonetheless coordinate with. The Head of the Charles is so popular, all events get over-subscribed by hundreds of rowers. As a result, they hold a lottery for people who enter some events much like the London Marathon system. 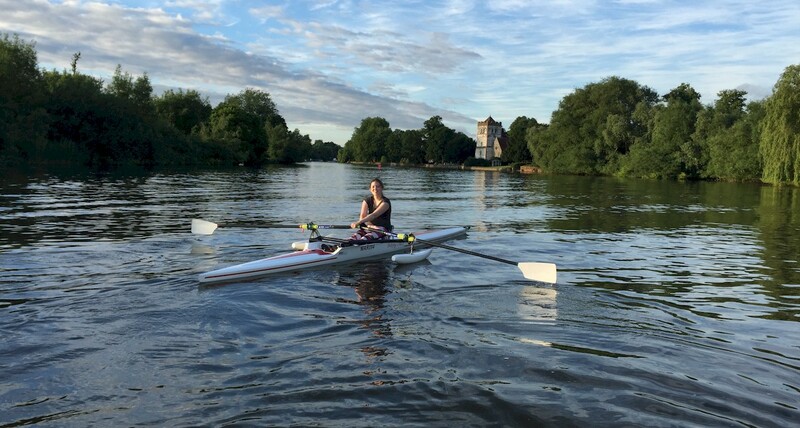 In fact, there are a range of rules for entry acceptance designed to enable as many people to experience the event as possible as well as to give some preference to top rowers (eg. ex-Olympians and previous regatta medalists). The Inclusion 2x event was introduced a few years ago, and similar to the UK experience with this format, it has proven hugely popular. So much so that now that event fills up and people get turned away. Don’t worry, though, the organizers tend to give preference to international rowers which add to the cachet of the regatta. Also, international entries are sort of self-filtering as only pretty good and pretty serious rowers would tend fly to the other side of the world to enter such a big event. The only entry requirement is that the entries have to self-certify that they can complete the 3 mile (4.8k) course in 29 minutes or less. £600 – Flight from London to Boston: If you book early and seek the best fares. £300 – Lodging for 6 nights: If you get modest lodging like an AirBNB or sharing with some other folk. You will need to book months in advance as the best deals and locations will book up very quickly for that week. You could stay fewer days, but you will want some time to do a practice outing ideally on the Thursday and probably some time for a bit of sightseeing. £300 – Meals. Again assuming 6 days and not hitting the Michelin star eateries. As a Massachusetts native and HOCR veteran, I made sure that the Marlow Adaptive contingent got to visit some of the Boston and Cambridge landmarks including the storied Harvard Stadium. This towering concrete edifice was a memorable part of the training for every Harvard “Crew” athlete. Running nearly 100 steps 37 times over non-stop was such an epic part of the training regime that when Katinka and Ben arrived in Boston I thought it only appropriate to kick things off with a “Stadium Run”. Katinka completed it in storming time (albeit a little disgruntled at how painful it was when Ben had told her “it’ll be fun!”). Ben first conquered the Stadium when we came over two years ago and as best we can tell from various enquiries and investigations, he is the first Cerebral Palsy athlete to have ever completed a Stadium Run. This time he took 20 minutes off his PB! He commented on the fact that it was much easier this time, especially the coming down part, which he chalked up to the more aggressive stretching regimen he has undertaken in recent years. 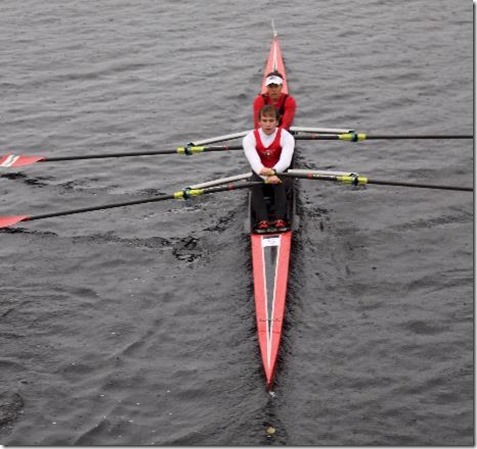 Flexibility is a fundamental part of good rowing technique and it is often impaired by short-fiber muscle building of strength training. For CP athletes this constant struggle with flexibility is even more intense as their condition aggravates flexibility in general and in particular when lactic acid builds in the muscle tissue (eg. when you are running hundreds of stairs). Beth Noll, who is the Adaptive Coach for both the USA squad and the big Community Rowing Inc. (CRI) rowing club, had taken Ben and I out for our practice session in 2016 and did so again for Ben and Katinka this year. On the water, she immediately noted to me how improved Ben was in his technique especially in the flexibility of his body rock. Logistics can be a bit daunting undertaking a high profile competition in a faraway place. If people plan in advance and contact HOCR, they can refer international competitors to the HOCR International Housing Committee, which helps find local host families for competitors to stay with for free. Any adaptive rower who is interested in trying this rowers bucket list experience, is welcome to contact me and I will be happy to assist with advice and guidance as will Ben and Kingsley. Commit to applying early and have a partner excited to go. Listen carefully to Beth Noll at CRI, she’s a fantastic coach and will help you have your best race. Give yourself enough time to recover from being very excited about racing. Enjoy the race, it’s an utterly incredible experience! An amazing experience which always lives up to the hype regardless of race conditions! Hearing all the cheering and commentators is quite a rush. Big world class congratulations to Ben and Kingsley (as well as their supporters Katinka and Ruth) for representing UK Adaptive rowing at the premiere event in the rowing world. Ben Marsden and Katinka Ernst emerging from the infamous Weeks Footbridge with a perfect line.